##"HCl"## has no orbital hybridization. Chlorine's ##3s## is too low in energy to interact with hydrogen's ##1s##, but chlorine's ##3p_z## can interact with hydrogen's ##1s## atomic orbital just fine. A good general rule is that being less than about ##12## ##eV## apart in energy is required for orbitals to be close enough in energy. The ##3s## and ##3p## orbitals of ##"Cl"## are apparently too far apart in energy to interact for orbital hybridization. ##1b_1## and ##1b_2## are nonbonding because the ##3p_x## and ##3p_y## atomic orbitals of chlorine weren't compatible with hydrogen's ##1s##, and the ##1a_1## is nonbonding because the ##3s## of chlorine is too low in energy to interact with hydrogen's ##1s##. ##2a_1## and ##3a_1## are the ##sigma_z## and ##sigma_z^"*"## bonding and antibonding MOs, respectively. They form because the ##1s## of hydrogen is compatible and close enough in energy to the ##3p_z## of chlorine. 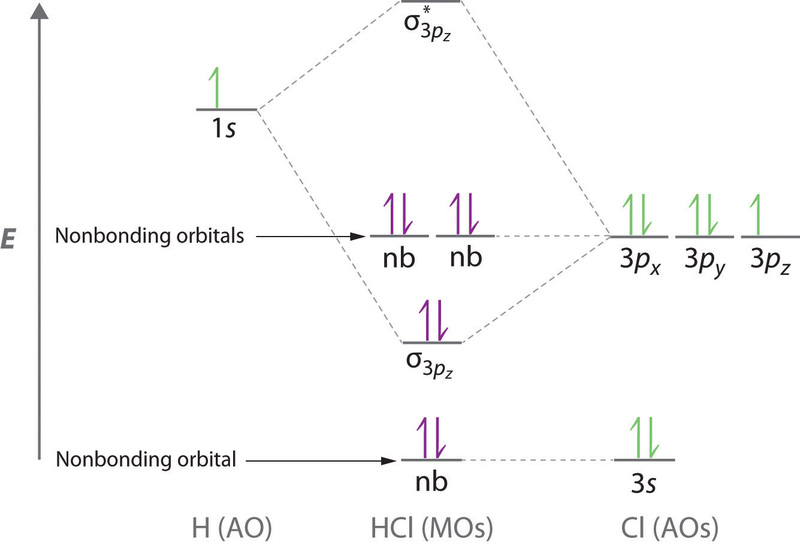 Nonbonding orbitals arise when two orbitals are NOT compatible and/or NOT close enough in energy. Although the ##3s## and ##3p## atomic orbitals are less than ##"12 eV"## apart, if they were to be able to interact, then given the closeness in energy to the ##1s## atomic orbital of ##"H"##, that ##1s## of ##"H"## would be able to interact with the ##3s## of ##"Cl"## too. The ##3s## and ##1s## are compatible (just know that they are compatible; the why is outside the scope of your level of education). So, if they were close enough in energy, they would interact, and then there would not be one nonbonding orbital from the ##3s## to hold one of the three lone pairs of electrons on ##"Cl"##, when we know that lone pair should be accounted for by the Lewis dot structure. Therefore, there is no orbital hybridization in ##"HCl"##.